The Floor section of the Grid options, located in the Draw palette allows you to load reference images for the working planes you want to use. There are also settings to control visibility of the grids, the reference images, and the model itself. 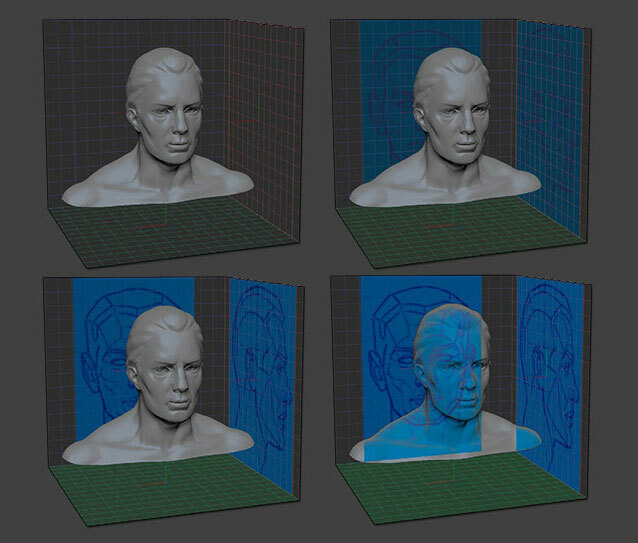 ZBrush can display a different image on each side of a grid plane. This is useful in situations where you need different front and back reference images. Once you load an image in the Draw palette for any of the planes, its grid will appear immediately even if it was disabled prior to this action. There are separate slots for each side of the grid, which become active as soon as two images are loaded. Load your reference images by pressing Import in the Texture palette and selecting the image files. You can hold Shift or Ctrl to select more than one image at a time. In order for the grids to show, load a model and put it in Edit mode. Any model will do as it can be swapped later. Turn on the Floor button (on the right of the UI or in the Draw palette) to show the grids. In the Draw palette, open the Front-Back menu section and click on Map1 icon. Select the Front image from the pop-up (or to load from disk, click Import on the pop-up and select the file). If you are using a Back image, click the Map2 icon and select the image. Select images for the Up-Down and Left-Right grids if you are using them. Image size and position can be adjusted using the Adjust button and other controls in each section. Before adjusting an image make sure the icon is highlighted orange. See Grid Options for further details. The Fill Mode slider next to the Floor button in the Draw palette controls model/image transparency. Set the slider to 3. Adjust the E Enhance Factor and E Enhance Opacity slider to get the right degree of transparency. Turn on the PLine button for each grid that you want the Projection Line to show. When you are happy with your grid you can save it using the the Save button towards the top of the Draw palette. To temporarily turn off a reference image, click the relevant axis letter inside the Floor button. To hide all refernce images, turn off the Floor button. If you wish to remove an image, simple click on its thumbnail to access the Texture pop-up menu. From there, choose the Texture Off item. You can also select a different texture to replace the current image. Grids can be saved by pressing the Save button towards the top of the Draw palette. All grid options are saved, including the images. Grids can be loaded by pressing the Load button in the Draw palette or through the Grids tab in Lightbox. When loading a grid, a model must be in Edit mode in order for the grid to appear.